Dwight David Howard is an American professional basketball player for the Houston Rockets of the National Basketball Association (NBA). Howard, who plays center, had an outstanding high school career at Southwest Atlanta Christian Academy. He chose to forgo college and entered the 2004 NBA draft, and was selected first overall by the Orlando Magic. An eight-time All-Star, eight-time All-NBA team selection, five-time All-Defensive member, and three-time Defensive Player of the Year, Howard has been ranked consistently as one of the best in the league in rebounds, blocks, field goal percentage and free throw attempts, and has set numerous franchise and league records. He led the Magic to three division titles and one conference title, and he was the winner of the 2008 NBA Slam Dunk Contest. In the 2008 Olympics, he was the starting center for Team USA, which went on to win the gold medal. 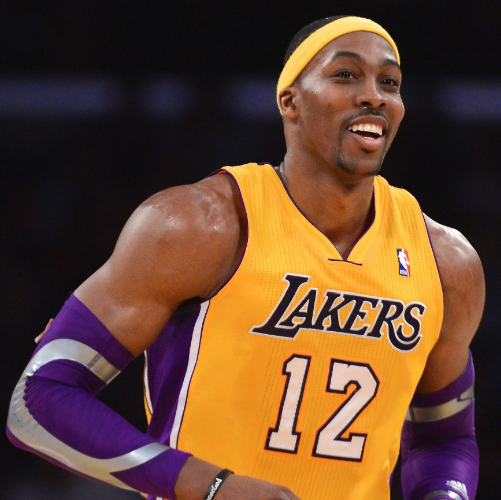 He was traded to the Los Angeles Lakers in 2012, and signed with the Rockets in 2013.